Heat oven to 400°F. Line cookie sheet with cooking parchment paper or spray with Crisco® Original No-Stick Cooking Spray. Unroll pizza crust dough; press dough into 15x9-inch rectangle. In small bowl, combine cream cheese and sun-dried tomatoes; mix well. Spread over dough to within 1/2 inch of edges. Top with pepperoni, onion, artichokes, chicken and mozzarella cheese. Sprinkle with Italian seasoning and 1/2 teaspoon of the garlic salt. Starting on 1 long side, roll up. Press seam firmly to seal. Place, seam side down, on cookie sheet. Brush top with olive oil. Sprinkle with remaining 1/2 teaspoon garlic salt and rosemary; press rosemary into dough. Bake 20 to 30 minutes or until deep golden brown. Cool 10 minutes. 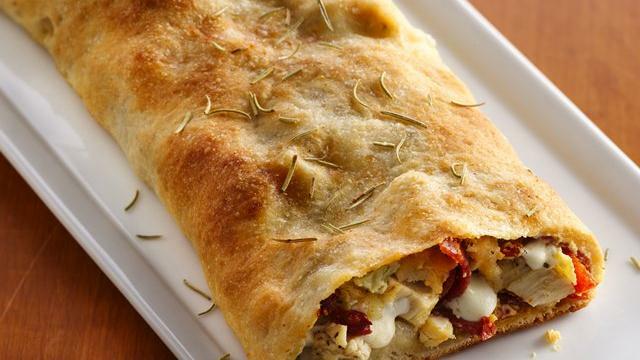 what do you replace Pillsbury® refrigerated classic pizza crust with?